Kwame Alexander knows how to harness the power of story, the power of poetry to touch readers' hearts, to make us laugh and sigh, to make us feel. If your kids like realistic stories that are funny, fast and heartfelt, get your hands on his newest book, Rebound, which hit shelves this week. Like many twelve year olds, Charlie Bell just wants to hang with his friends and read comics. He's angry at his mom, yet we realize that his bitterness runs far deeper than your typical preteen moods. Charlie's dad died suddenly and he's left alone, angry and alienated---struggling to survive in a black hole, after his "star exploded / and everything / froze." By using metaphors, Kwame helps readers connect with Charlie's intense grief while giving space for Charlie to sidestep around soft feelings. Kids might not want to talk about their feelings, but they certainly know what it means to wrestle with them. He also paces this story so well, weaving together humor and action with heavier moments. Charlie begins the summer under the weight of his emotions. Having hit an impasse with his mother, she sends him to live with his grandparents for the summer. Grandfather calls him Chuck, brings him to the Boys and Girls Club with him, and is full of corny refrains ("Champions train, chumps complain, Chuck. Love. Work. Eat. In that order. Time to get in the game, Chuck!"). This is by no means a sports story, but basketball is key. Even better, Kwame has created a new genre-bending blend: slam poetry comics! Just love the illustrations by artist Dawud Anyabwile. "They had the ball, talking trash. and his was all cash." 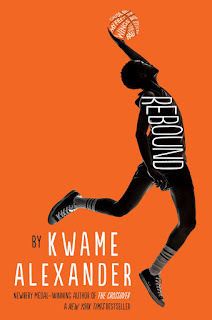 Kwame creates a great cast of supporting characters in Rebound, with Charlie's family and close friends. I especially love that two of his close friends are girls. CJ is brainy, sassy and sweet. Roxie can play ball better than most of the boys. She has a "crown of braids" and is "tall as a sequoia, and she walks like there's music in her roots." Oh my, isn't that how you want your daughters to think of themselves?! Readers will discover many layers within Rebound. They'll go back and realize the connections between Chuck Bell, the dad in The Crossover, and why he never wanted to go to the hospital for checkups. They might see Grandpa's sayings in the rules for life in The Playbook. Or they might think about how they face hard times themselves. Kwame himself knows how to push through difficulties. He discovered after Rebound went to press that there are some problems with the timeline. Rebound is set in the summer of 1988, but he originally wrote it set in the mid-90s. A few of the cultural references (songs, basketball players) didn't shift when he revised it to the late-80s. These details might be important to us old folks who remember back-in-the-day, but I truly don't think they'll matter to the core audience. The power of the rebound shows how you can overcome setbacks. Rebound is way more than a prequel to The Crossover. It's a powerful story in its own right, one that will resonate with many young readers. I look forward to sharing it with as many kids, families and teachers as I can. Illustrations copyright ©2017 Dawud Anyabwile. I purchased the review copy, the first of many copies I hope to read and give to students. If you make a purchase using the Amazon links on this site, a small portion goes to Great Kid Books. Thank you for your support.